And now I will appeal to someone more authoritative then Dostoevsky or Dylan. The Galilean prophet had been hauled before Pontius Pilate by the Sanhedrin. Caiaphas, the high priest, accused Jesus of claiming to be a king — a seditious act punishable by crucifixion. Jesus was now to be tried before the Roman governor. The trial was held in Pilate’s praetorium. The marble-adorned palace, the governor’s stately attire, the presence of the imperial seal all produced an atmosphere of authority and grandeur. Jesus was on trial before the Roman Empire. Which is to say Jesus was on trial before the world in all its glory. Jesus had refused that world during the wilderness temptation and now the spurned world was striking back. 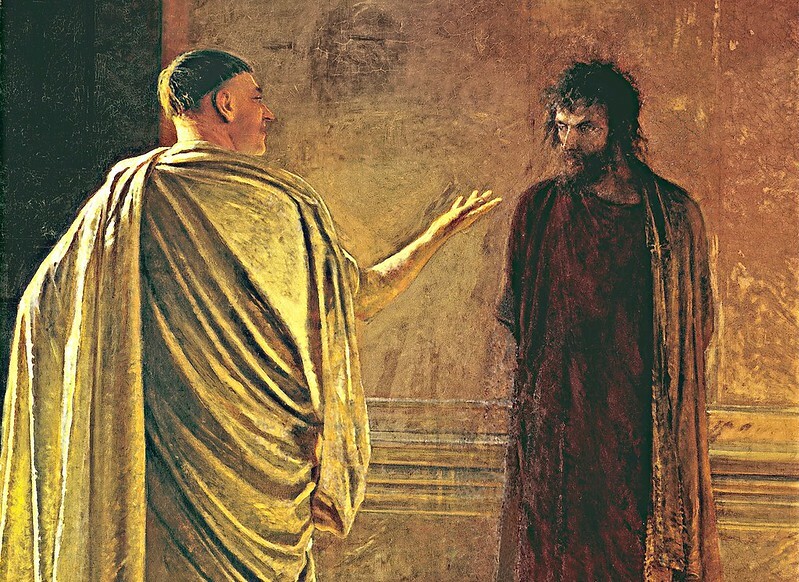 Jesus tells the Roman governor that the purpose of his life is to bear witness to the truth. Jesus knows that the world as it’s arranged (and most gloriously represented in the splendor and majesty of the Roman Empire) is built upon an enormous falsehood. Jesus then says that those who can feel the falseness will be inclined to listen to what he has to say. (“Everyone who is of the truth listens to my voice.”) Jesus claims not only to be a king, but to possess the ultimate truth that exposes the lie that the world has become. Pilate has answered his own question. What is truth? Truth is the power to kill. According to Pilate, the truth is that the world is run by those who have power. Military power. Economic power. Religious power. The world is run by people like Governor Pilate, King Herod, and the high priest, Caiaphas. And most of all the world is run by the Emperor. Caesar is Truth. Because it all comes down to power. Power trumps everything. That’s the falseness that prevails in society. That’s the deception of the material life. But can’t you feel the falseness of it all? Don’t you know it’s all a lie? Resist it! Don’t tolerate it! Rise above it! The meaning of life is not power, the meaning of life is love. God is not Nietzsche’s totalized Will to Power; God is Love. It’s not proximity to power that is the goal of life; the goal of life is love. When we see faith leaders fawning over proximity to political power, don’t we feel the falseness of their faith? Don’t we know they too are confessing, “we have no king but Caesar”? I feel the falseness. And I’m determined to resist it, to struggle against it. Jesus is the world’s true king. Right now. Jesus is not going to be king some day, Jesus is King of Kings right now! He was crowned as king on the cross and God vindicated Christ as the world’s true king by raising him from the dead. I believe this. I confess this. I seek to live this. In the kingdom of the Prince of Peace we study war no more; we turn swords into plowshares and spears into pruning hooks; we turn tanks into tractors and missile silos into grain silos. Our task is not to turn the world into the battlefield; our task is to turn the world into a garden. Our goal is not Armageddon; our goal is New Jerusalem. We’re marching to Zion; the beautiful city of God. They can’t feel the falseness. They are the falseness. But if you can feel the falseness, that’s good. It means you still have a heart for the truth. So if you feel the falseness, keep listening to the truth that Jesus speaks. Keep believing in the truth that Jesus is. Let Jesus lead you out of the falseness — the falseness of a world built around power. Follow Jesus into his kingdom of love. The meaning of life is not power. That’s the prevailing falsehood. The meaning of life is love. That’s the eternal truth. Caesar is not the truth. Christ is the truth. May we have courage to live the truth. P.S. Here’s my Feel the Falseness playlist.